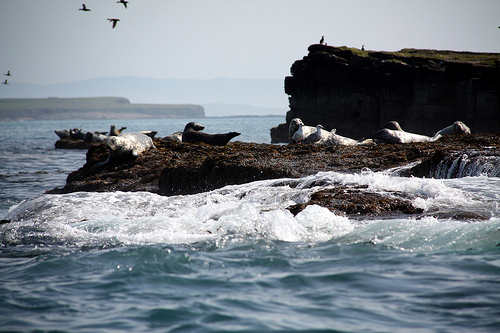 Many islands off the coast of Ireland have been abandoned, left to the seals and the birds. I came across an interesting documentary about the abandonment of Inis Airc, a tiny island off the Galway coast. Right next to the much-larger Inis Bofin, Inis Airc would have have supported about 300 people at the start of the famine (the famine being the high-water mark for the Irish population as a whole). By 1960, the inhabitants numbered just 24. The key reasons the population left seem to have been the incredible hardship of island life, coupled with the difficulty of getting to or from the island. Inis Airc lacked a pier or jetty, so tiny currachs were the only way on or off. The inhabitants could be cut off for weeks during winter, with no way to get help to the sick, or bring in food or supplies. Other islands remained inhabited once newer piers and berthing facilities were put in place, but the cost of such for all the Irish islands inhabited at the turn of the century would have been enormous. TG4 made a documentary about the abandonment of the Irish in 2007, and it can be found, in several parts, on YouTube. The tale of Inis Airc is similar to the abandonment of many other Irish islands over the course of the twentieth century. The Blaskets off Co. Kerry are the ones I’m most familiar with, mainly due to the compulsory reading of Peig Sayers’ Irish-language memoir in school. There’s plenty of info on the Blaskets and island life from the mid-19th century on, thanks to several memoirs written in the early days of the Irish state by several islanders. I’ve only ever been out to the Aran Islands, so perhaps I should add the Blaskets or some of the other uninhabited islands to my bucket list. Before that, it’s time to dig out that old copy of Peig, and see how my childhood Irish has stood up to the years and life in a foreign country. This is a fine documentary – thanks for bringing it to our attention. I haven’t been on the Blaskets but only to see them from the edge of Dingle. I’ve read Peig, but in English. I wonder if the isolation of island life creates a richer language? She certainly had the gift.